I wanted to post this while I was on vacation last week at Disneyland so that it would have been up on my sisters actual birthday but our Hotel WiFi did not want to work for us. So here it is a few days late but that is ok.
She is also very competitive and if you look at all the post I did for her five children Brady, Kelsey, McKenzie, Zach and Sydnee. You can tell that they are all very sports oriented and competitive kids. Kanani has spent countless hours driving her kids to practices and watching their games. It seems like there never is a weekend that at least one of her children are participating in some game or meet. 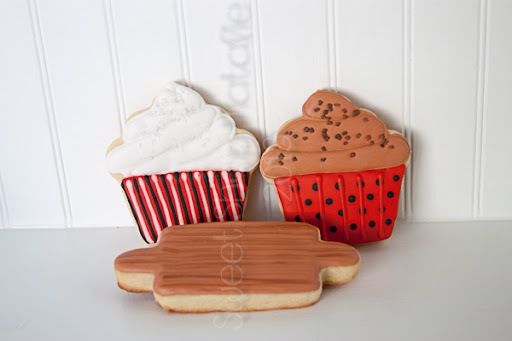 She likes to make cupcakes and she makes some awesome rolls so I wanted to do some cookies to represent her talents of baking so I did a couple of cupcakes and a rolling pin. 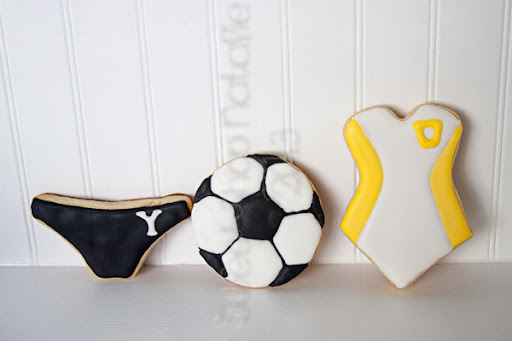 This next pic is to represent all the swim meets and soccer games she has attended to support her children. Her oldest swam for BYU and her middle child will start swimming for the Y in the fall. The yellow suit is to represent Orem High swimming which three of the kids have been on the team there. And I think that everyone of them played soccer and of course the youngest two still do. Another thing I think of when I think of Kanani is Hawaii. Not because her name is Hawaiian but they have gone to Hawaii on their family vacations for quite some time. Pretty sure if they lived there they would be the #1 surfing family. 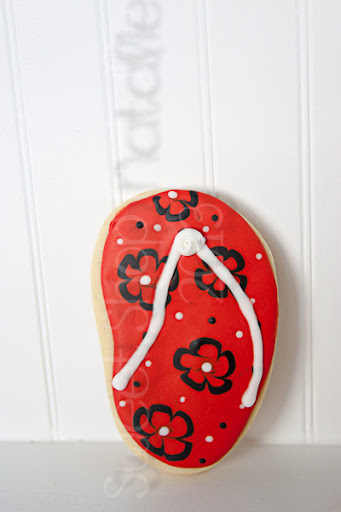 So I thought I would do a flip flop cookie to represent that. Now these by far are not my best. I have decided that cars, truck and motorcycles are not my thing. When Kanani saw these she thought it was because she is the one driving her kids all over the place but in fact I did these because they represent my memory of Kanani. It is supposed to be a 1983 Nissan Sentry hatchback. The real car looked pretty much looked like the car on the left. Not sure what year it was but I am thinking 1985/86. I would have been around 13/14 years old. I don't have the best memory but this is what I remember. It was summer time and we were having a family reunion out at Deer Springs Ranch. I for some reason got to ride out with Kanani to the cabins. Kanani was cool cause she was in college and she had a cool new (used) car. When we pulled off of the main highway to the smaller road Kanani pulled over and she let me DRIVE her car. I was way excited. To a 12/14 year old getting to drive a car is a big deal. All you ever want to do as a teen is to be able to drive. I can't remember how the drive went, I think it was a stick shift and it was a little tricky to drive. We obviously both survived the event. But I remember thinking that my sister loved me and that she was so cool to let me drive her car for a little bit. This birthday was my sisters 50th, I should have made a big 50 cookie but maybe she does not want that rubbed into her face. Hope you have a wonderful birthday Kanani!! Thanks Natalie! 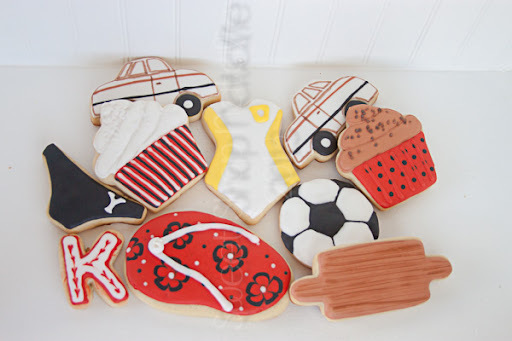 I loved the write up, it even brought tears to my eyes (got that from mom too :) I loved all the cookies too. Thank you!